She attended a class with Chad Alice Hagen a few years ago and is now “hooked.” Her focus went from quilts to felt. But one thing hasn’t changed — her love of embellishments, particularly beading which she has authored several books on. So, with her permission I have put together some of her tips from her blog on beading. 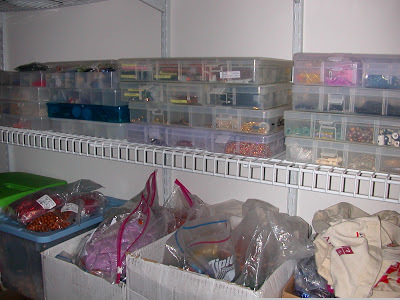 I’m often asked how I organize my beads……this method works well for me. First of all……you won’t use them if you can’t find them, so take the time to gather them from all your hiding places, organize them, and then put them in a convenient place…no matter how many or few you have. A location away from sunlight, heat, and excess moisture is best. Because there are no closets in my studio, my teaching materials are stored in a large walk in closet in a guest room nearby. The bulk of my workshops in recent years have focused on beading techniques or projects that incorporate beads. Therefore, I purchase a LOT of beads in bulk from a distributor for my classes. They generally come as strung kilos, which I repackage into kits and store in boxes and plastic bins. Above is my own personal stash…… One entire side of the closet is fitted from floor to ceiling with shelves…and almost all are used to store my embellishments. I could consolidate them if the space was needed for other things, but as it is now, I’m easily able to walk in and quickly find what I’m looking for without having to dig through dozens of items stacked on top of each other. 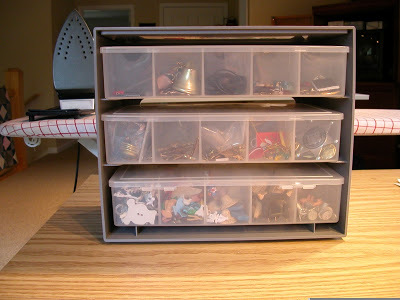 I like to use plastic fishing tackle boxes, or embroidery floss containers. 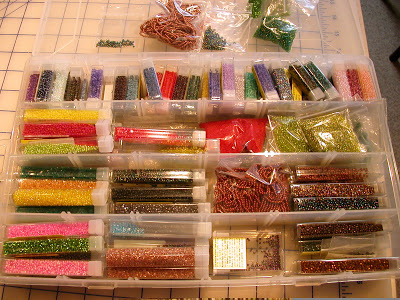 Beads are stored by style and color in see-thru plastic tubes or small bags. Here you see some seed beads. Besides using beads, I utilize many other embellishments, trinkets, charms, buttons, found objects into my work. This unit has plastic pull out containers with large divided sections which are more suitable for these items. It too goes on my shelves in the closet. If tubes or small bags aren’t handy for you….try storing beads in small containers such as film canisters, pill bottles, or metal breath mint cases. If you glue a bead to the lid….you’ll always be able to quickly know what’s inside! Another big key to beading……is making your environment comfortable during the task. 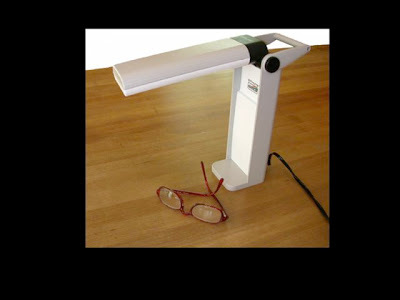 A table top or floor model Ott light will save on eye strain. As will a pair of ‘cheater glasses’. I always tell my students that one of the biggest secrets to successful beading is ‘spacing’….and the ability to see the bead and to judge the placement of the needle into the fabric is vital. Many people are unaware that beads may not necessarily be colorfast. For instance, this beautiful blue bugle bead below may appear as if it’s blue glass. Not so……it’s clear glass that has been dyed or painted blue. Often the color remains secure on the bead, other times not. 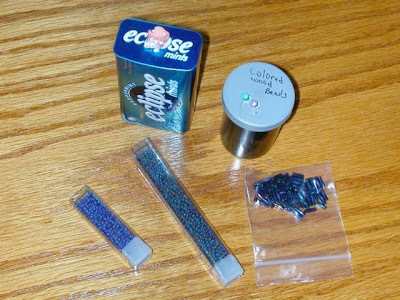 So…..if you think there’s a possibility that your project will be washed, become damp, or even require high steam for pressing…..take a few minutes and test your beads for colorfastness. Most of the time, there isn’t a problem, but for that heirloom project….you’d be devastated if during a final steam pressing, the bead color ran into your fabric. The pricier beads may be just at risk as the less expensive ones…..you can’t tell by looking. 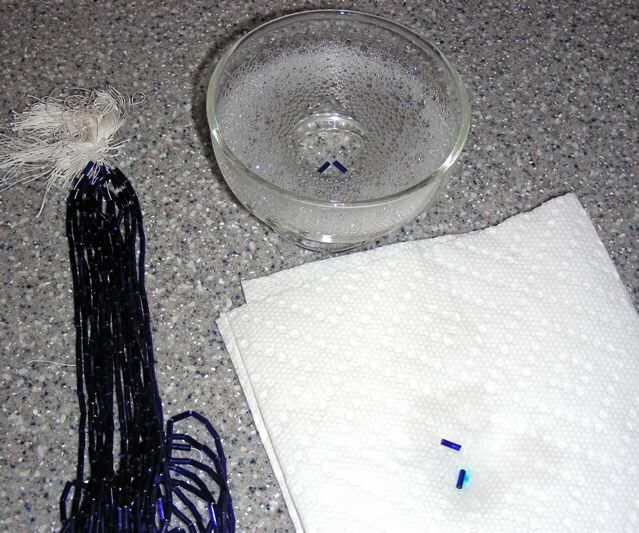 – Fill a shallow dish with hot sudsy water….drop in a few beads….let it sit for 15 mins. – Remove them…rinse and let dry on a paper towel. Note….sometimes color will be visible in the water, other times….the color will slowly eek out as it dries. As you can see….this blue bead has run…..red is another color I check carefully. Don’t let this scare you…….we are all aware that colorfastness can be an issue with fabrics……now you know that beads carry the same risk. 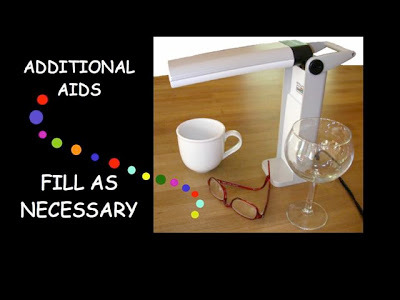 Even if the bead color doesn’t run….sometimes the fancy coatings……that make a bead’s surface shimmer with various affects, (like rainbow) can dissipate……and the bead will lose its luster. I’ve tested very, very few beads that I decided not to use……or that I’ve used with caution……beading is worth any effort….hopefully with this hint….all your projects will continue to shine brightly! I’m a stickler for good quality construction…..for me it’s not all about fast, rather…it’s about great design that has been executed to the best of my ability. If precautions aren’t taken, beading can cause fabrics to distort. Therefore, I ALWAYS secure my work in a Q-snap frame. The only exception is when I’m beading the bindings/edges of my quilts. 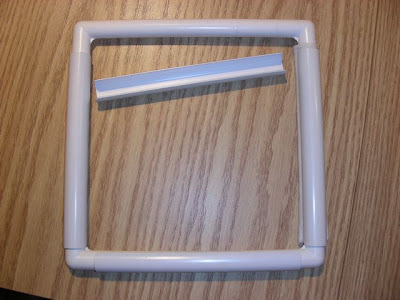 Q-snap frames are simply PVC tubes which come in a variety of sizes. This one is 11″ x 11″, my choice for smaller projects. The work is attached using clips that snap over the frame. 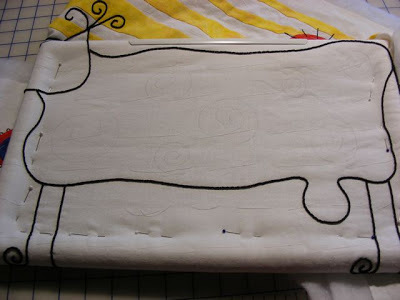 Though you could use a round embroidery hoop…..I don’t because it pulls the fabric diagonally which can stretch the bias. 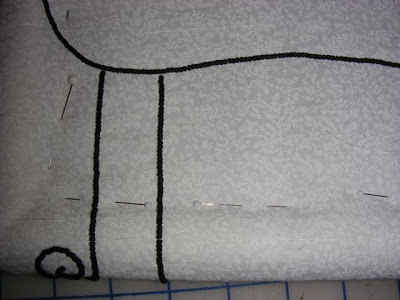 I’ve found it’s best to keep the fabric ON GRAIN by using a square or rectangular frame when beading. As for felt, unless the felt is super thick and sturdy, I always secure fabric (of any kind) in a Q-snap frame for beading and embroidery. However, I generally avoid using the plastic clips…….instead I attach the material using muslin sleeves or pin the fabric around the frame to avoid damage to the fabric and beads. There’s nothing more unattractive than distorted, stretched out wool!!! However, as the beading design develops, requiring repositioning of the fabric, I avoid using the clips in places where they could damage the beads. Instead, if the piece is large enough as it is in this sample, I wrap the excess snugly around the frame, and secure the layers together using straight pins or by thread basting. This keeps the fabric on grain, and well stabilized to assure good thread and fabric tension. My ‘artist’ inspired piece is now in the beading phase…. The piece is attached to an 11″x17″ Q-snap frame…note I used 1 clip at the top, where it didn’t interfere with the beads. I also want to mention that I’m beading through 2 layers only…..the quilt top which has been stabilized with batting. This approach will hide and protect the threads once the backing is added later. Thanks Mary for sharing some of your beading tips with us! This entry was posted in Beading, Meet the artist and tagged Beading, beads, embellishments, felt, quilting, tips. Bookmark the permalink. What a fascinating insight into your beading! Your closet where you store most of your stash must be heavenly to walk into and you are quite right about the need to be able to see what you have. I hadn’t realised about the colour fastness on beads so thank you for explaining that. I agree with you about embroidery hoops – I’ve never been happy to use them as I feel that they tug too hard on fabric especially where the hoops go together. Thank you Lyn for your note……one can never have too many bright shiny objects!!! great post, I too didn’t know about colourfastness, so great tips. The clip frames are a brilliant idea for beading. That was very informative, Mary. I know very little about beading, and you really opened my eyes to the process. Personally, I find beading a bit too “fiddly,” but I so appreciate the work of fiber artists like yourself. Great information. I am glad you let us share it. I didn’t know beads could bleed . I have had their coating chip off before though. I have seen pictures of the damage the first plastic and Bakelite buttons and beads did to fabric. Thank you all for your kind comments. I certainly wouldn’t want to dissuade anyone from using beads in regard to the colorfastness of beads! Honestly, most work featuring beads will never be washed anyway, so it’s not a huge issue, but for those heirloom projects…..it’s worth checking. Thanks Mary – this is great information. I tend not to use too many beads on my work although I did make a really fancy bead book a couple of years ago. It was fun to make.